Independent films and chickens are an odd combination, but I ran across this fun little documentary called Chickens in the City and it inspired my most recent chicken portrait. 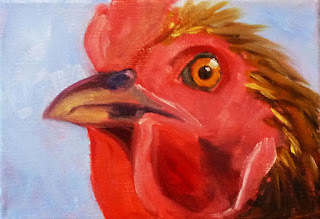 This original painting is 5x7 inches and catches the evil eye of a wicked bird. There are lots of reasons why roosters are not allowed in cities, but this guy can go anywhere. For purchase of reproductions of this painting, visit here to see prices and size availability. For the first time, I'm exploring the option of selling reproductions of some of my paintings. I needed some note cards and decided it would be fun to have some of my paintings on the front. Joining Fine Art America provided me with a lot of options. I ordered the note cards that initially started me in this direction and then uploaded a few photos just to see how it works. It ended up being really exciting. Now folks can purchase canvas prints, acrylic prints, framed prints, art prints, metal prints, and greeting cards created from my paintings. My goal is to photograph some of my larger paintings and begin to upload them for those who would like this option. My new gallery at Fine Art America is here. Please visit, I'll be adding new work as often as I can. Here's the link to purchase reproductions of this guy. The Oregon coast has been a recent inspiration. It has so many beautiful land formations, rocks, and sea stacks that I never get tired of exploring. 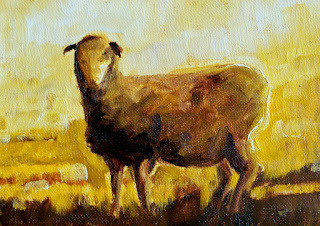 This painting is5x7 inches and has already SOLD, but it has a companion on the same theme that can still be purchased. Click here to view the companion. Smith Rock is well-known to avid rock climbers all over the country. In Central Oregon, this was news to me. I am not a rock climber and was totally amazed at what these climbers can do. If you hike the area, it is common to see people hanging off the walls as if they were related to Spider man. If you want to learn more about this amazing place, visit this site where you can learn about the "several thousand climbs in the [state] park. More than a thousand [of which] are bolted routes." 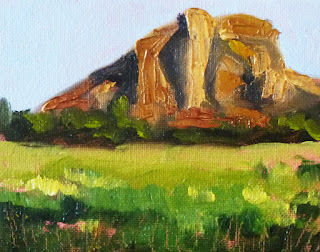 My last visit to Smith Rock State Park inspired this small landscape oil painting. It is 4x5 inches and was created with heavily textured paint. You can see closeups of the painting and/or make a purchase by visiting here. Painting glass is a lot of fun. I have a nice little collection of bottles and am always looking for different shapes and colors. This little 6x6 inch painting shows a small selection of some of my bottles and a pear that my neighbor brought over from his tree. 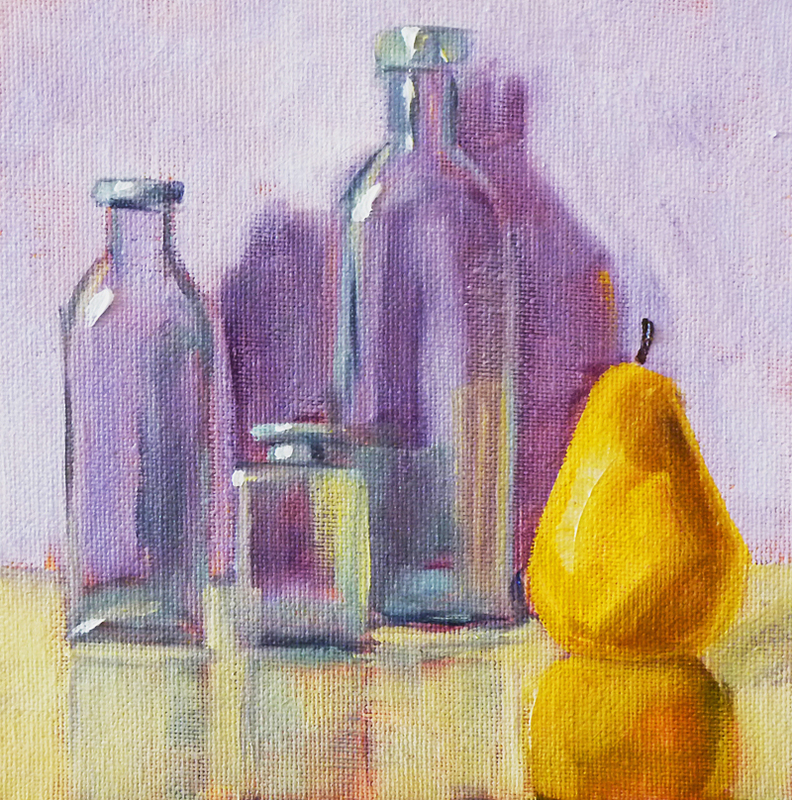 The pear was sweet and the bottles were just plain fun to paint. 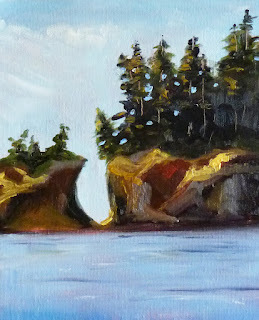 The painting is 6x6 inches in oil and can be viewed or purchased here. The high desert of Central Oregon is home to sage brush and pine trees. These two little pines are growing in a prairie just outside Smith Rock State Park. I snapped a photo last July while watching my daughter competed in a 10k run. It was early morning and the air was crisp, but the promise of a warm day hovered in the atmosphere. It wasn't long until the long shadows of sunrise had disappeared and the heat of the day demanded relief. The painting is 6x8 inches on a gallery-wrapped canvas and has already SOLD. Visit my Etsy shop for more small landscape oil paintings. 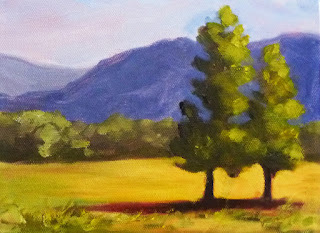 There are more yellow landscape paintings at Fine Art America. In my backyard I have a funny little apple tree. When we first bought the house, the previous owner claimed it produced five different kinds of apples, but they all look the same to me--green and underdeveloped, or red and bug eaten. The tree grows like crazy and every year we are hacking away at over grown branches. 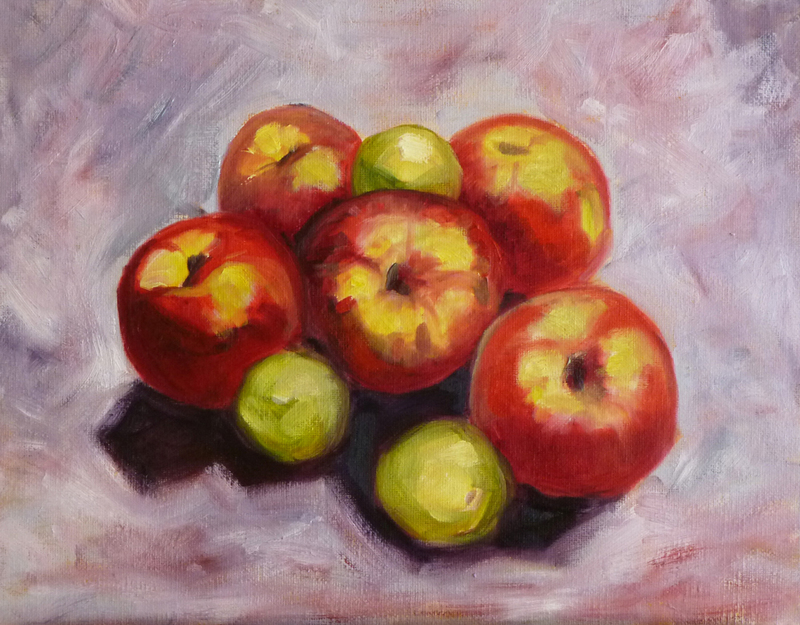 This 11x14-inch oil painting was inspired by a recent apple harvest. Too bad they don't taste good. You can purchase this painting or view it in a gallery by clicking this link. There are more of my still life fruit paintings at Fine Art America. Because the auction from last week was successful, I offered this little 5x7-inch painting of a lamb at sunset in the same auction format. 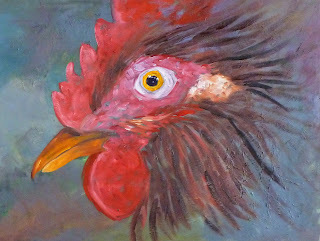 It has already sold, but you can view some of my other paintings of animals, landscape, and still life at my Etsy Shop. 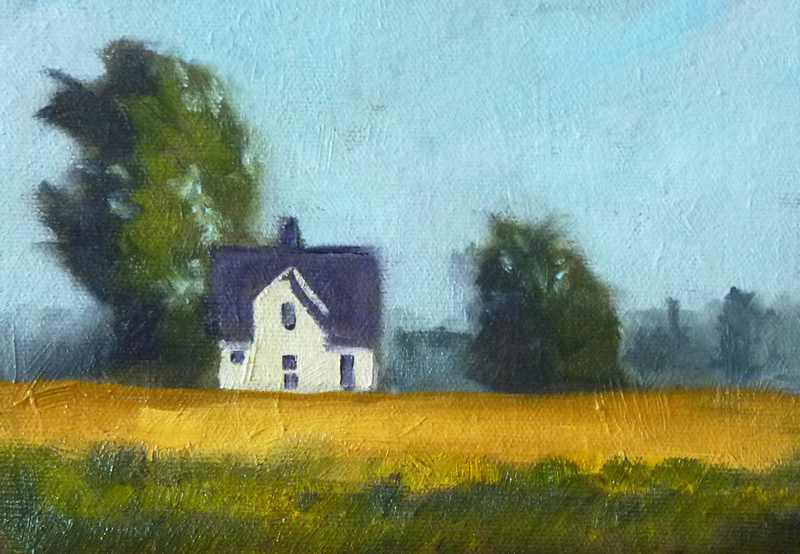 Today's little painting is 5x7 inches and was inspired by a breezy September afternoon. The sun is out, but there is a crispness to the air that says summer is almost gone. It as already SOLD, but you can view some of my other small landscape oil paintings for sale here. 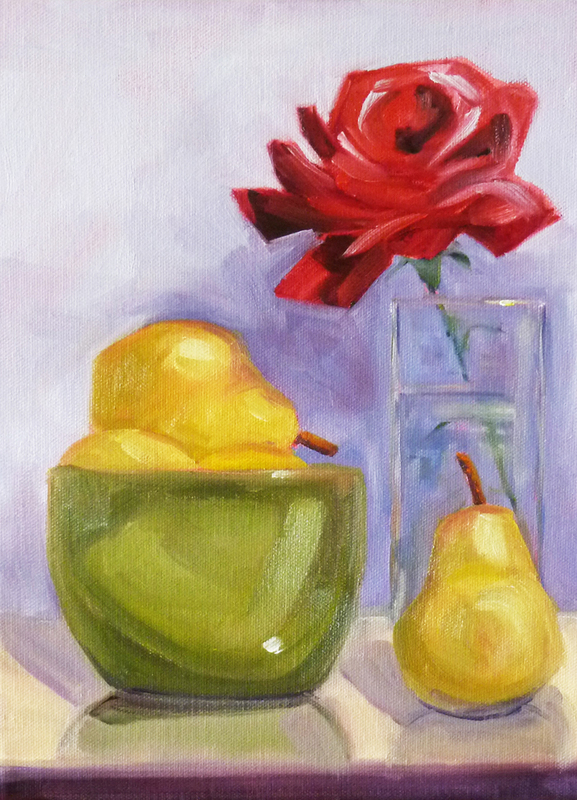 Painting glass, shiny objects,and roses are always on my list of challenging objects to paint. This 9x12 painting had all of those challenges, but what started my inspiration was the green ceramic bowl. Sitting on a shelf at the local Goodwill, it called to me and said, "I have interesting reflections; I am a delightful color; you should take me home." So, I did. The paint is dry and the painting can be viewed or purchased here at my Etsy Shop.